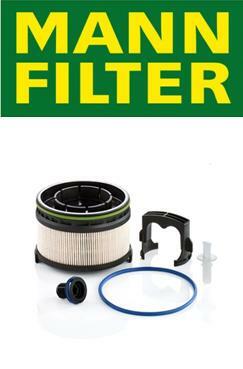 Despite being identical in their appearance there is a fundamental difference between MANN-FILTER fuel filters PU 11 001 z KIT and PU 11 002 z KIT. Both use innovative three-stage water separation to achieve over 90% separation efficiency but the filer media varies. This is because Mercedes diesel engines use two different injection systems. They operate at different pressures meaning that varying separation efficiency is required. These means despite looking the same these filters are not interchangeable. PU 11 001 z KIT uses MULTIGRADE F-MB 333 media which achieves a particle separation efficiency of 99.7% and protects diesel injection nozzles up to 2500 bar, which is much higher than many standard engines. Whereas, MULTIGRADE F_HE media is used in PU 11 002 z KIT to achieve a 95% separation and protecting diesel injection nozzles up to the standard 2000 bar. PU 11 001 z KIT applications are: Mercedes-Benz CLS (C257), E-Class, E-Class Cabrio (W/S213, A238), GLE (W167), S-Class / S-Class Coupé / Cabrio (W222, A/C217). PU 11 002 z KIT applications are: Mercedes-Benz A-Class (W177), B-Class (W247), C-Class (W205/A205/C205/S205), E-Class, E-Class Cabrio (W/S213, A238).